Tropics of Wonder! I recently visited the Exuma district of the Bahamas, a collection of over 360 divine little islands dotted with towering palm trees and soft white sand. In Exuma, the water is clearer (and more divine) than an icy martini. While there, tour company Island Routes hooked me up with seafaring father/son team of Ray and Justin Lightbourne of Exuma Water Sports. Stunning sites (and mom’s intoxicating, uh literally, rum cake) ensued. The Lightbournes — lifelong locals — can take guests on a variety of tours, including trips to the famous cave shot in 007 flick Thunderball and to an island full of swimming wild pigs. Alas, the day we set to sea was violently choppy, due to a rare cold weather front. Though I barely comprehend how safety trumps seeing swimming wild pigs, I skipped the big sites further away and opted for a shorter voyage. Not that I’m complaining. 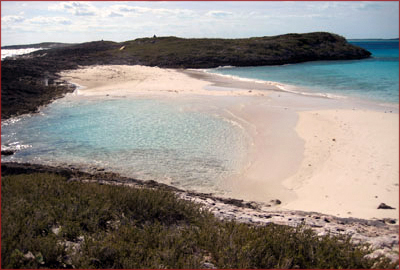 One stop was the small cay, or island, pictured above – so deserted and unvisited that it didn’t even have a name. (For the Blue Lagoon or Castaway inclined, the Lightbournes can drop you here with a picnic lunch and come back for you at a designated time.) The still pools are shallow and calm enough to sit in, with the sun transforming them into hot tubs. Craggy rocks bear holes to the surf and create blowholes when waves crash down below. Back on the boat, Ray guided us to several stingrays and dove in the water to fetch platter-sized starfish for passengers to feel and fondle (fyi — very pointy and hard). He also took us to a small island owned by Nicholas Cage. (?!) 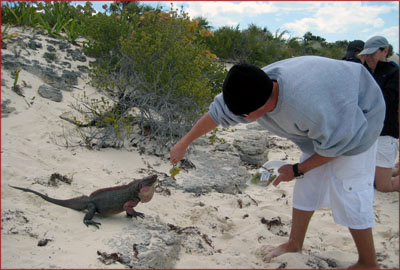 There, Justin had wild iguanas eating grapes right out of his hand! 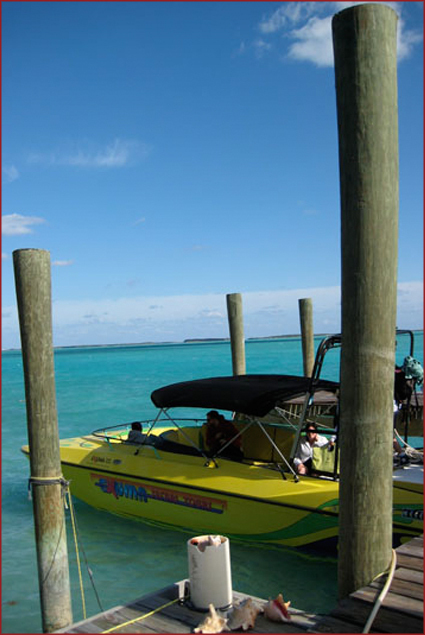 Exuma isn’t the cheapest or easiest Bahamas destination to get to (hello, connecting flights) but its isolation contributes to a mood of untouched wild that overtouristed islands can only evoke on brochures.